Please enjoy the slide-show >>> then scroll down to read and view more details. Use the buttons above to navigate to our different departments/sections. Feel free to contact us with any enquiries that you may have. 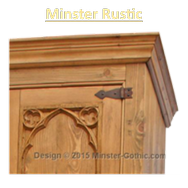 Minster-Gothic is a unique furniture business, offering a variety of products and services. As the name suggests, over the 40+ years we have been established we have become specialists in gothic style furniture and accessories. We’re not a huge enterprise, just a husband and wife team. I’m Dave and I do all the design work. My wife Angela keeps my feet on the ground, and more often than not is responsible for the staining and polishing of our bespoke items of furniture. 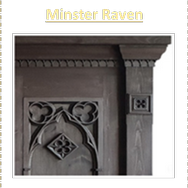 All the items of Minster-Gothic that we design are expertly made for us by a skilled local cabinet-maker. 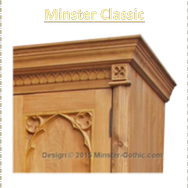 The Minster-Gothic range is totally unique to us! It is not obtainable anywhere else in the known universe. Each piece is individually made by hand. There is no mass-production involved. This is why all the range can be tailored to our customers’ individual needs. Of course you can order any item you see on the site, but we’re always happy to design and make new items for you. These items will be then be added to the website and usually named after the customer who ordered. 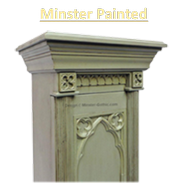 The Minster-Gothic range provides for all rooms in the house/office/commercial premise. Living room, Dining Room, Study, Bedroom and Kitchen . Plus! We are lucky enough to be able to offer a beautiful range of gothic style, stone-effect mirrors and accessories. We never fail to get superb feedback from customers regarding this range. We also supply other Gothic Style interior design accessories. If gothic is not your style you may wish to take advantage of our Made to order Pine Furniture service. 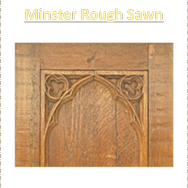 Our cabinet-maker can make almost any item to any size and finish. One of his specialities is making SOLID PINE FITTED KITCHENS made to your exact requirements. Also one of his specialities is painted furniture. Any questions whatsoever just feel free to get in touch .